Businesses often fail in their social media efforts for the same reason New Year’s resolutions fail: It’s a good idea, but there’s no structure or commitment. Has this happened to your business’s social media presence? You aren’t alone. Very few people can simply choose to be active in social media and stick with it. For the rest of us, we need something to keep us honest. That’s why I advocate youcreate a social media plan—a checklist, if you will—complete with daily maintenance, recurring tasks and milestone projects. These seven tips will help you design a social media plan that will keep you on track, active and moving forward. Before you even start creating your plan, you have to make a promise. Establishing a healthy social media presence can be a very slow process. You can’t expect your list of fans, followers or subscribers to grow overnight. You don’t want to start your business’s presence out by posting and updating consistently, only to get bored, lose interest and forget to log in when there’s no immediate gratification. To prevent that kind of slide, make a commitment. Even if it’s just to yourself—even if you have to frame it and hang it above your computer. No matter how silly an exercise it may seem, acknowledging and agreeing with yourself that building this presence could take upwards of a year (and then some), and then promising to invest time, energy and resources into it no matter what, will keep you committed and prepare you to be active and engaged even when you feel like your presence is stagnating. If you’re just getting your business’s social media efforts up and running, part of creating your plan revolves around seeing if you already have a fanbase out there. Search for your business on sites like Yelp. Thank customers for their good reviews, and apologize to customers who gave bad reviews. You could turn that bad experience into a loyal customer and a better review. So do some searching. Are there lots of people posting videos to YouTube of themselves using your product? Does your company have a bunch of mentions on Twitter? Do you have reviews on Yelp? Although it’s important to establish a presence on a giant like Facebook, make sure you also set up shop where you’re already visible. Now that you’ve identified the social media platforms you’re going to focus on, it’s time to turn your attention to the ways and frequency with which you’ll engage with your users. Infrequent interaction is one of the main reasons businesses experience social media failure. Those who are most successful in social media know that you have to engage steadily. Funny, engaging and prolific, Taco Bell’s Twitter feed provides fans with frequent news, entertainment and engagement—a model for other companies. Think of creating and responding to comments, tweets, posts, etc., as simple daily maintenance. It must be done. You need to start the conversation with your users, and anytime they reach out to you, you need to be prepared to respond. Remember that the timetable for creating and responding to content is platform-specific. Twitter moves so fast that tweets can become irrelevant within the hour, whereas Facebook status updates and posts have a few hours of staying power, and videos are great because of their longevity. 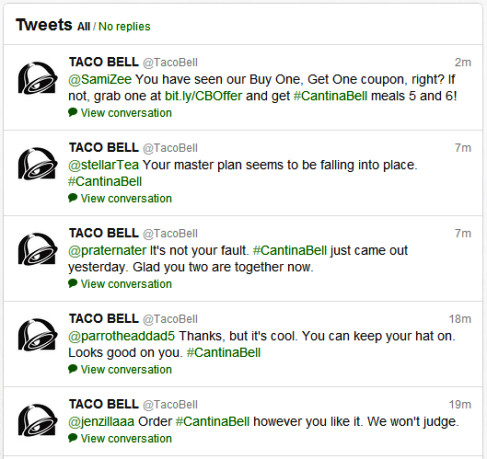 Your fans and followers don’t want commercials, they want conversation. They don’t want to hear how great your company is, they already like or follow you. They don’t want sales numbers, they want industry news and thought leadership. A good rule of thumb is to talk about your customers and your industry 80% to 90% of the time, and then discuss your own business. That means you need to start a blog, write white papers, explore trends, release case studies and create infographics. Post frequently and do it consistently. Your ideal goal should be some kind of content every couple of days or so. Avoid going longer than a week without posting. Thorough, in-depth articles and papers will position your business as an industry expert and thought leader, and keep your fans and followers (and even competitors) looking to you. MailChimp’s more than 30 Guides cover a range of topics—from email marketing best practices to papers on how to use MailChimp most effectively—positioning them as a leader in email marketing. Contests and promotions keep fans and followers excited, interested and coming back. Most importantly, they’re a covert way to get your business or brand in front of more people. That doesn’t mean you need to run one all the time. If you’ve always got some kind of giveaway going, they’ll soon become more social background noise. This is especially true if you’re giving away not-so-great prizes. Run a contest or promotion every couple of months, and make sure the prize is something to get excited about. 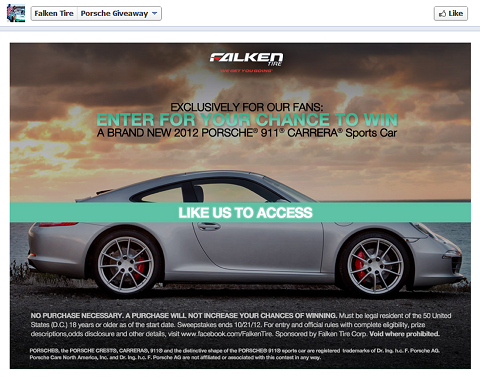 Falken Tire’s Porsche Giveaway is gated to fans only. And when the prize is as great as a Porsche, their fanbase is sure to be active and their fan count is sure to go up. Every social media plan needs to start out the same way, with a commitment to the long haul and a focus on the basics like interaction and content. But once your presence is established and your users are engaged, you’re free to open things up to experimentation. If you’ve built a solid fan following on Facebook, create and install some custom apps on your page, start posting videos on YouTube or interact more frequentlyby hopping on Twitter. Try things out for a few months, and then go back and see how they’ve performed for you. Not every platform will be a fit, so if your business isn’t performing well on one for an extended period of time, don’t be afraid to pull the plug and explore different options. Rosetta Stone’s numerous custom apps help them better engage their fanbase of over 1.1 million. If you’re at the point where you’re looking at expanding to new platforms, congratulations! You’ve likely got a healthy presence. But don’t let all of this growth overwhelm you. The larger you grow, the more in danger you are of failing to engage (point #3), because—let’s face it—social media is a lot of work. So look into adding some more team members. Graphic artists for your infographics, writers for your blogs and white papers and even some interns to manage the day-to-day social media conversations and information-gathering. A talented team can give you a richer, more robust presence than you could ever achieve on your own.